CORPUS CHRISTI - The second homestand of the 2019 season at Whataburger Field includes discounted concessions and group packages, the chance to win free tickets, and a second chance at the limited edition Whataburger Field 15th season jersey. 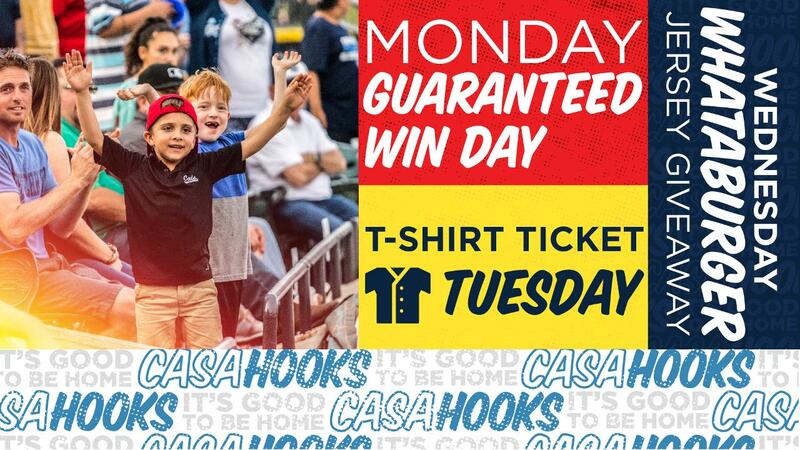 The Hooks host the Frisco RoughRiders for a three-game series that includes "Guaranteed Win Day." Fans will receive a free ticket to the game on April 22nd at Whataburger Field if the Hooks lose on Monday. Also on Monday fans can enjoy the first Dollar Day presented by Mrs. Baird's. Discounted concessions include $1 hot dogs, soda, and prize wheel spins. T-Shirt Ticket Tuesday will reward fans who buy a t-shirt at the team store with a free GA ticket to the game. The Hook, Line, and Sinker team store is open at 9 a.m. on Tuesday morning and fans will receive their ticket upon purchase. Mike Shaw Automotive continues the 4-for-$40 deal on Tuesdays in 2019. The package includes four tickets, four hot dogs, and four sodas all for $40. Furthermore, fans can book groups at half-price on Tuesdays. Wednesday features the return of the Whataburger Field 15th season jersey giveaway for all fans. Families can also take advantage of Whataburger Family Day as kids get in free with a paid adult ticket.